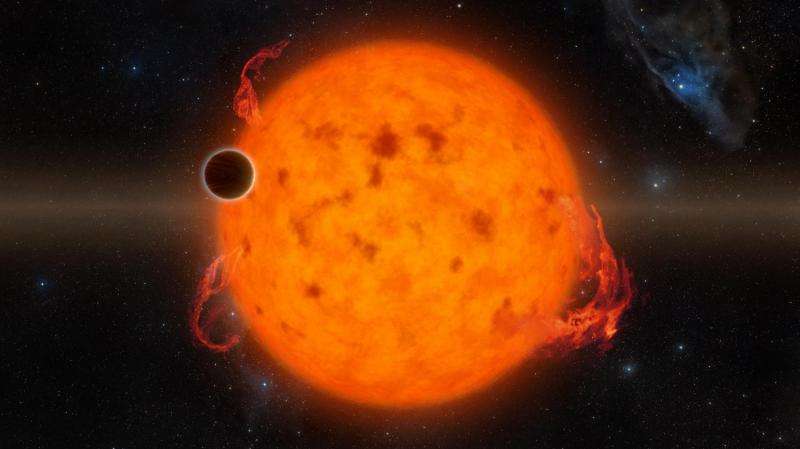 A team of astronomers has confirmed the existence of a young planet, only 11 million years old, that orbits very close to its star (at 0.05 AU), with an orbital period of 5.4 days. Approximately 5 times the size of the Earth, the new planet is a "super-Neptune" and the youngest such planet known. The discovery lends unique insights into the origin of planetary system architectures. Andrew Mann (University of Texas at Austin), the first author of the study, is intrigued by these results, because how and when close-in planets achieve their orbital radii may affect the outcome of terrestrial planet formation. "If Jupiter or Neptune had migrated inward after the terrestrial planets formed, it seems unlikely that our Solar System would have an Earth, or any of the terrestrial planets at all," he speculated. 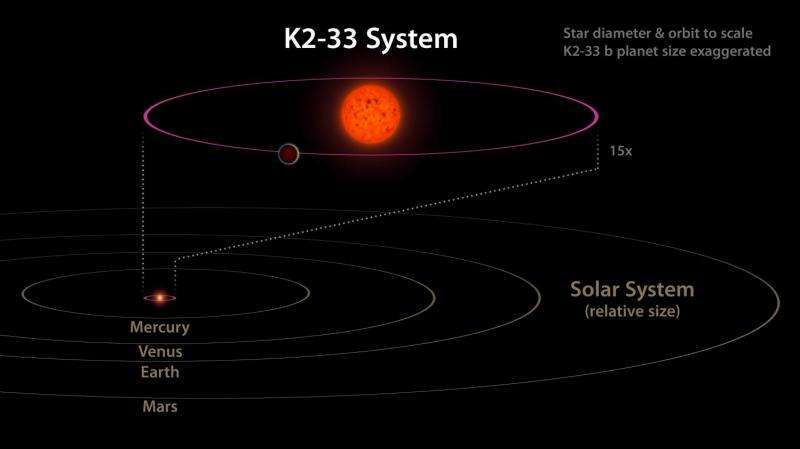 K2-33b was first identified using data from NASA's repurposed Kepler mission, K2. To confirm the existence of the planet and to characterize its properties, the team conducted an extensive suite of follow up observations. Explaining the need for these observations, Mann said, "Young stars are trickier to study than the older stars around which most planets are found. They vary intrinsically as a result of stellar activity and they may be surrounded by the debris (dust and rocks) from planet formation. We were able to reject these as explanations for the observed transit signal." Observations with ARCoIRIS, the new infrared spectrograph on the 4-m Blanco telescope at the Cerro Tololo Inter-American Observatory (CTIO), played a critical role in measuring the size of the planet. "Because the flux decrement measured during a transit constrains the ratio of the planet and stellar radii, a good measurement of the stellar radius is needed to infer the planet's radius. The ARCoIRIS spectrum measures the stellar luminosity and, thereby, the stellar radius," explained NOAO astronomer David James, a coauthor on the study. 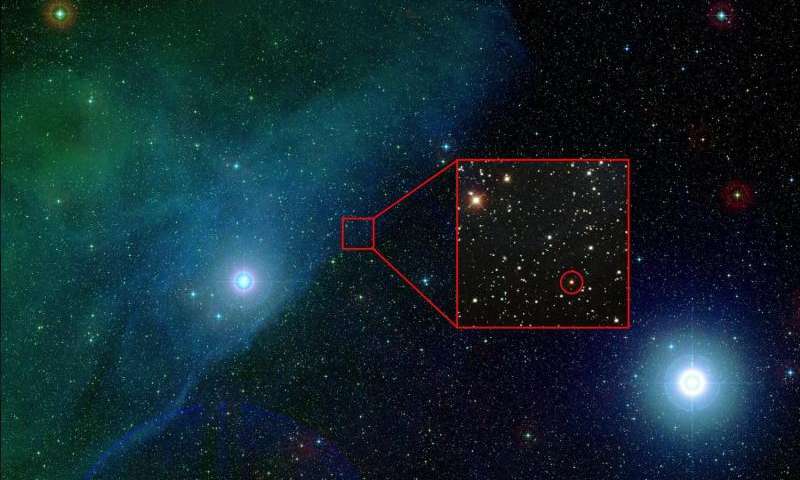 Additional high-resolution imaging and Doppler spectroscopy confirmed that the transiting object is not a stellar companion or a background eclipsing binary blended with the target. The high resolution imaging was carried out with NIRC2 on the Keck II telescope, and the Doppler spectroscopy with the Immersion Grating Infrared Spectrometer (IGRINS) on the 2.7-m Harlan J. Smith telescope at UT Austin's McDonald Observatory. Additional transits of the planet were observed with the MEarth arrays at the Whipple Observatory on Mount Hopkins, Arizona and at CTIO. More information: "Zodiacal Exoplanets in Time (ZEIT) III: A Short-period Planet Orbiting a Pre-Main-Sequence Star in the Upper Scorpius OB Association", Andrew W. Mann et al. 2016, Astronomical Journal (preprint: arxiv.org/abs/1604.06165 ).